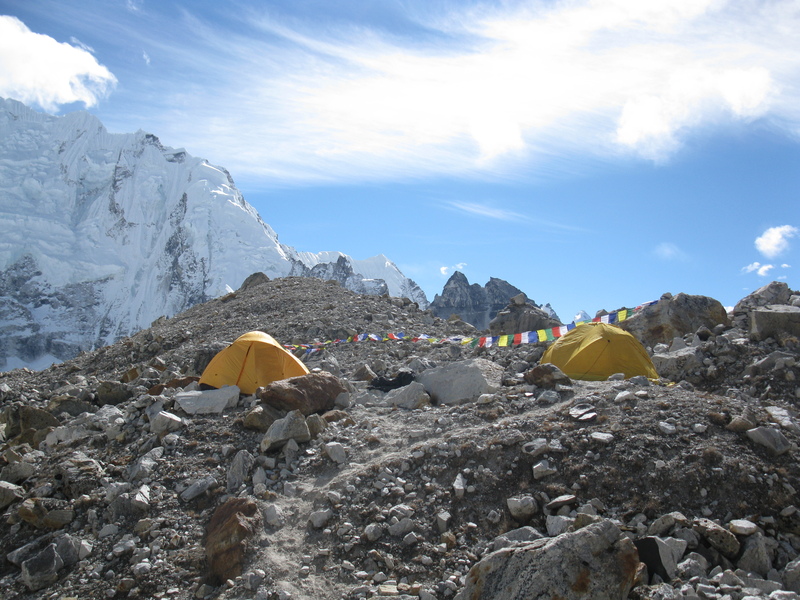 Pumori Base Camp. Weather before team departure. I look at the men sitting around me in the kitchen tent, lit only by the climbing team’s and the cook’s headlamps and… a small candle. The three climbing Sherpas, who have just come down from the Southwest Ridge of Pumori after battling 60-70mph winds trying to fix rope along the route, look utterly spent. Their faces are gaunt and sunken in the scarce light. 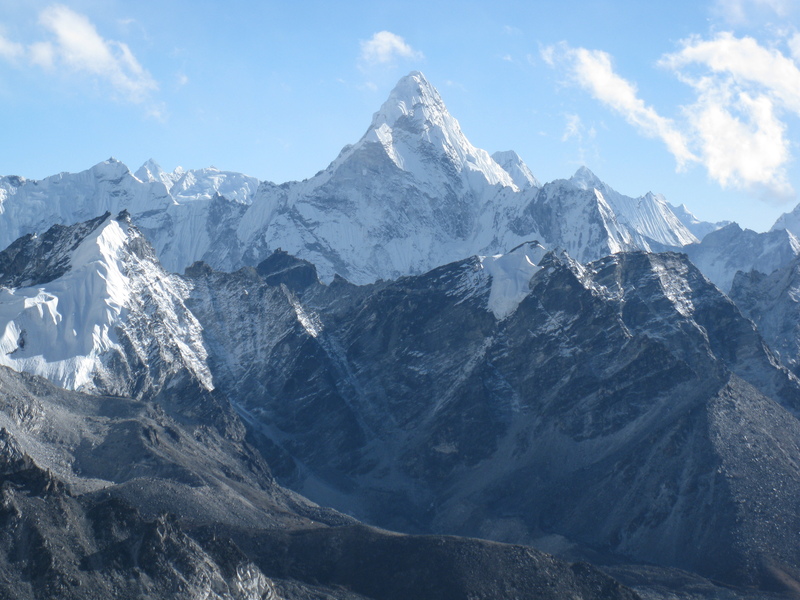 They are warming their hands, which my whim to climb Pumori in winter could have cost them, against aluminum cups of steaming hot tea. 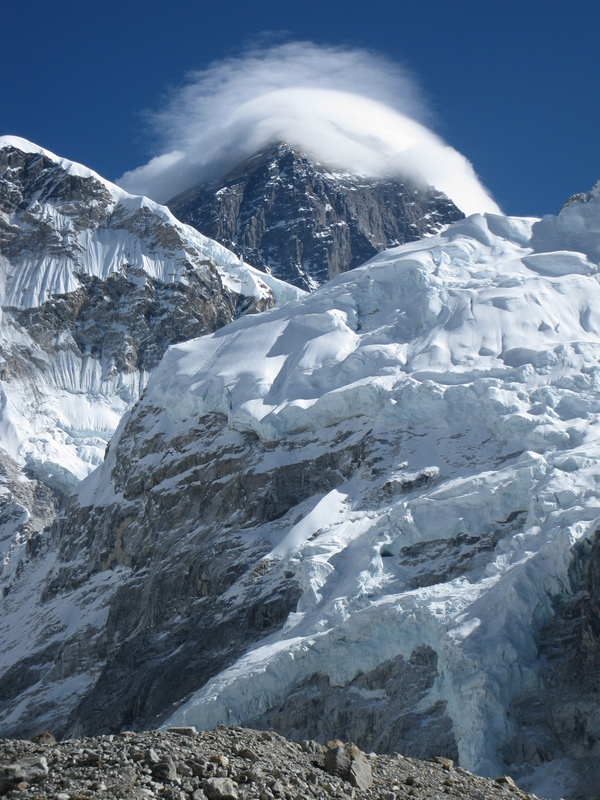 ‘If the wind is too strong on the ridge, come down with your gear, don’t risk anything,’ I told the three Sherpas over 12 hours ago in the morning when they were leaving base camp to work on the route. 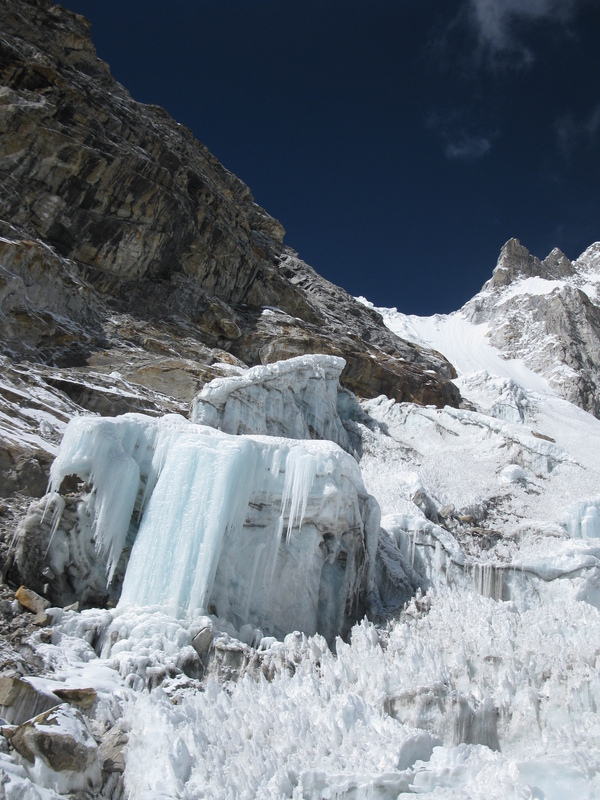 The winds, weather forecasts predicted, would only get stronger above 6500 meters from that day on, and climbing would be impossible anyway. A long wait at the frigid base camp would also be difficult for the boys and, perhaps, too difficult for me. I hoped the forecasts would, perhaps, be wrong, but the faces of my Sherpas tell me the winds were indeed as relentless as expected. The bulky backpacks they brought down are unequivocal signs that we are not returning to the route. 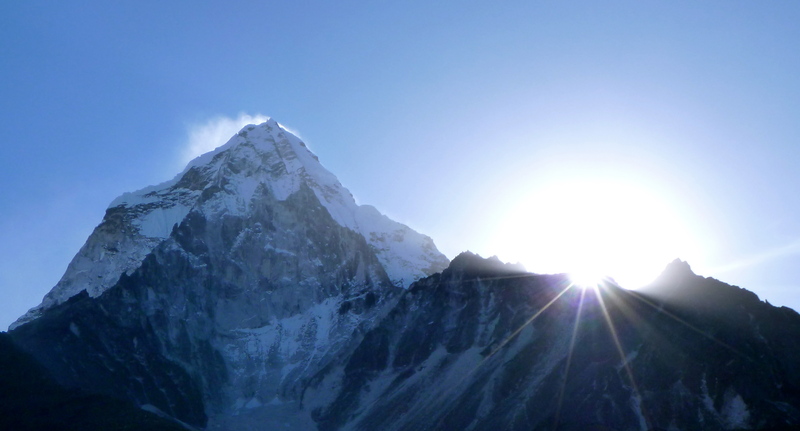 I am relieved to see everyone healthy if tired and disappointed, but I am also sorry to witness the end of what could be my last Himalayan dream. ‘I’m sorry, Mila,’ Dorje, the team’s sirdar, tells me, thinking that it is the impossibility of climbing Pumori that casts a shadow over my face. ‘Don’t be sorry,’ I say – to both him and myself. 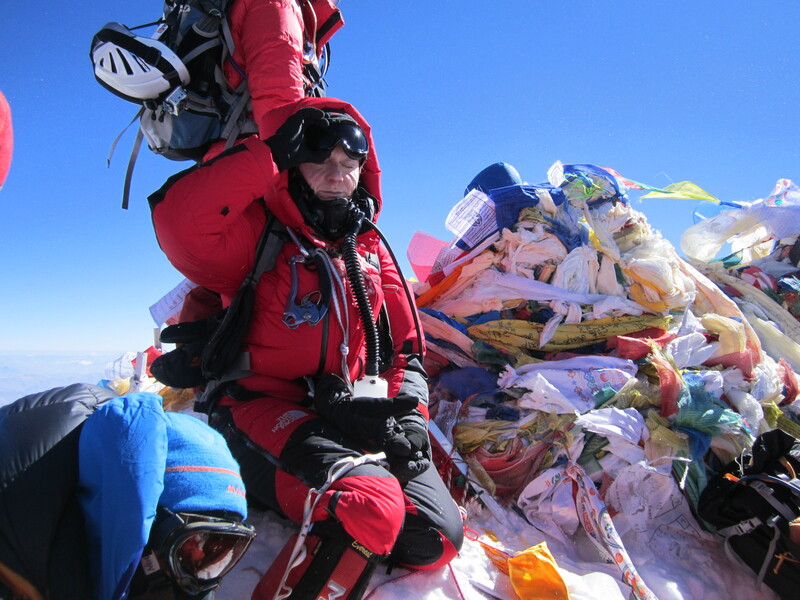 I then thank the boys wholeheartedly for their hard work fixing rope on the steep and exposed Southwest ridge, for waiting for days at the lifeless windy base camp when the weather halted their progress, for truly believing that I could, in fact, climb such a technically difficult route in winter and for putting their lives at risk to fulfill my dream. Six pairs of eyes look at me, six men hear my voice, but they don’t listen. ‘A waste of money and gear,’ Dorje sums up the sentiment. I like my voice that night – I recognize it again, at last. It sounds calm and certain; it knows what’s important. When the expedition was leaving Kathmandu, my voice and my whole attitude were different. ‘I can see that you have a strong team,’ someone, whose opinion counts, told me a few days before departure. ‘Yes, it is a strong team, except for me,’ I said. ‘I can see that, too,’ was the response of my interlocutor – a vocalization of what people see when they see me: someone, who is carried to the summits in a basket on the backs of her climbing Sherpas. Past my appearance and countenance people all too rarely see how much I actually love to climb and how hard and seriously I work at doing it well. Leaving Kathmandu before the Pumori expedition, I was not, as I used to do, simply setting out to scale a mountain that attracted me but also to prove that I was equal to the hardest of mountaineering tasks. I’d forgotten that to reach the summit is, in reality, not at all ‘the hardest of mountaineering tasks’. Trekking to Pumori base camp at 5300 meters took us 6 days. It was cold, hard to walk and even harder to breathe – as always. The busiest trekking trail in Nepal leading to Everest Base Camp looked empty – disappointingly so, as the winter sun was still friendly and welcoming, and the weather, if windy, was clear. Many of the mountains I passed I recognized as friends: the gloriously steep Thamserku, towering above Namche Bazaar and the trail to Tengboche, Ama Dablam – the most beautiful mountain I have climbed yet – standing tall and proud across the river from Pangboche, Cholatse on the way to Lobuche, which taught me to appreciate the people I climb with more than the mountains I crave to climb, and, of course, Everest, where a part of me fell asleep somewhere below the Second Step, and never woke up. I feel at home walking amongst these stone bodyguards of the mountain gods, whom I worship, and who don’t know I exist. 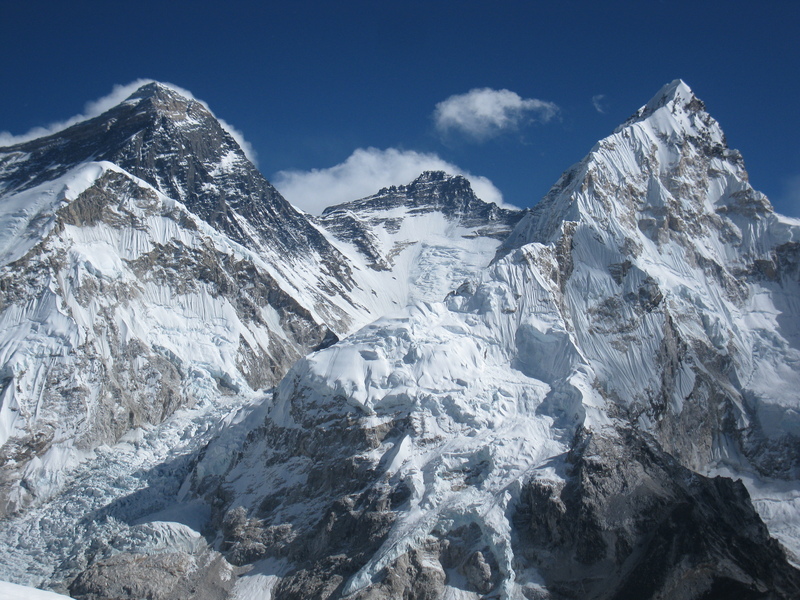 It is, however, with a heavy heart that I step onto the site of the Everest Memorial, where out of the frigid ground small chortens grow like brunch-less, bloodless tree trunks, decorated with memorial plates, telling trekkers and climbers about those who came before them – and would never leave now. 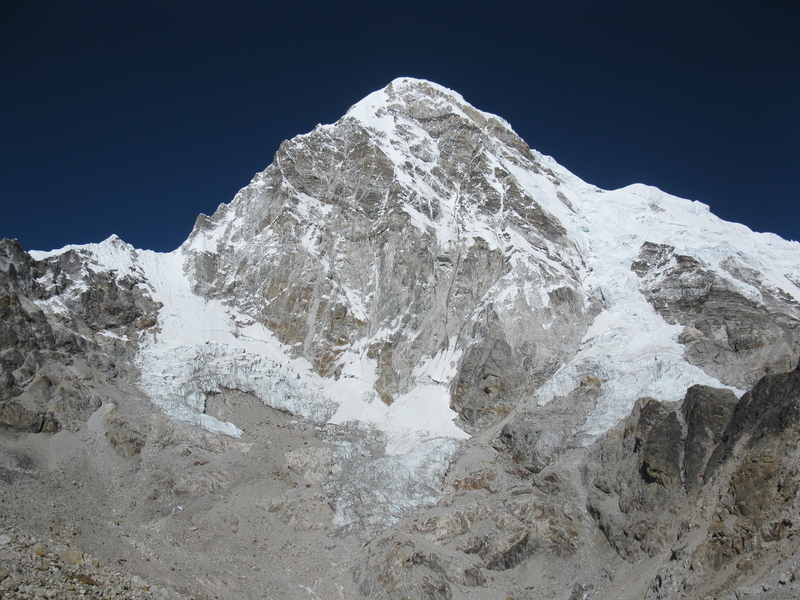 It is from here that I first see Pumori in her full stature. She seems to be one of the chortens, and I wonder briefly if she is waiting for my name to be inscribed on her Southwest Ridge. There have been no successful ascent of the mountain in 2012, and it doesn’t feel to me like we will be granted passage to her summit, either. 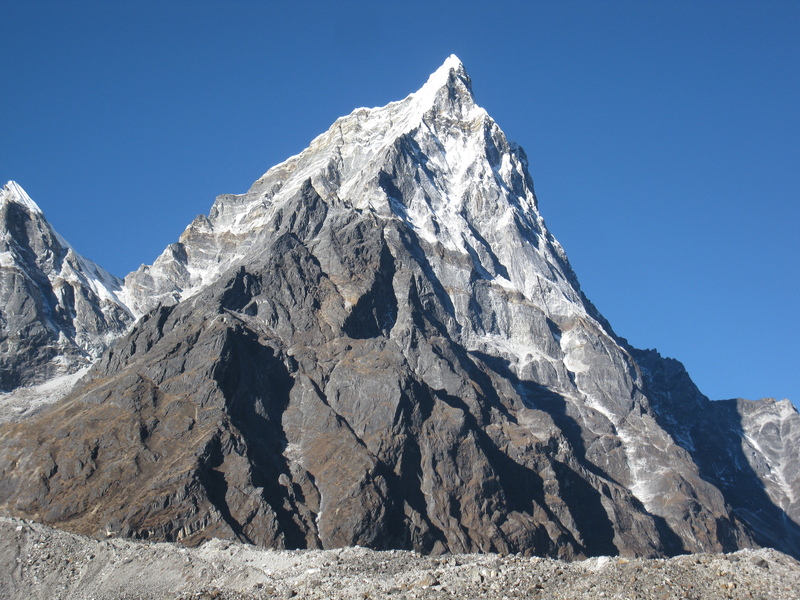 Nevertheless, the beauty of Pumori fascinates and draws me like a magnet, and when next morning I stand at our base camp at the foot of the mountain, I forget all about my fears and premonitions; I am ready and excited to go climbing.